The Akron-Canton Regional Foodbank’s annual Holiday Campaign runs Nov. 1 - Dec. 31, 2018. This time of year can be difficult for the 1 in 7 individuals in the Foodbank’s eight-county service area who struggle with hunger, and the Foodbank needs your support now more than ever. 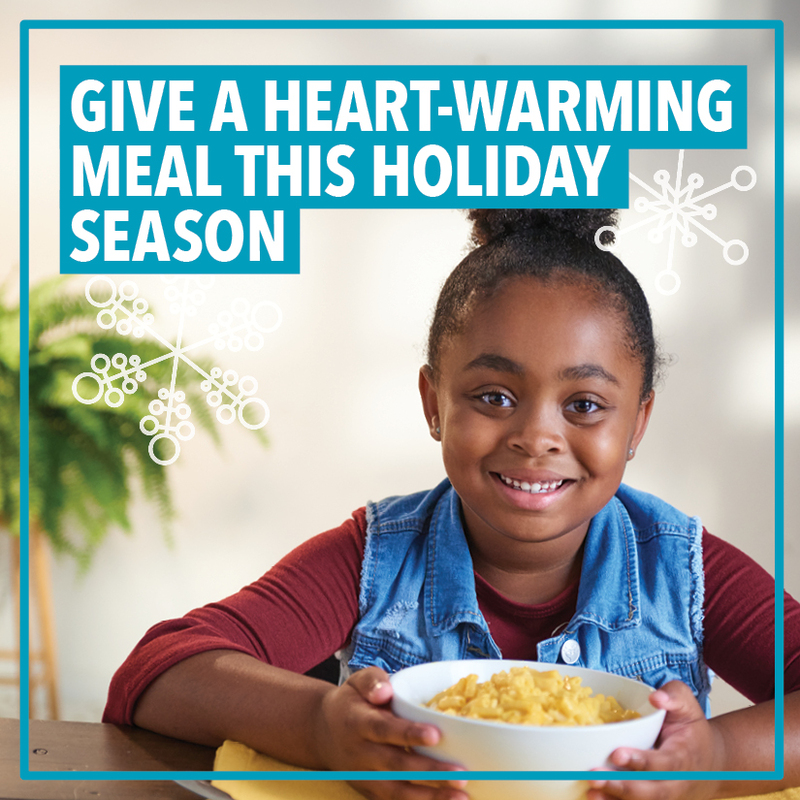 Join the Holiday Campaign and help provide more than 7 million heart-warming meals to families facing hunger this holiday season. The Foodbank is asking the community to get involved with the campaign, whether it’s through volunteering, making a financial donation, or joining other dedicated individuals, companies, nonprofits, schools and faith-based organizations in making a difference by starting a food and funds drive. The community’s support is vital to ensuring our neighbors facing hunger are able to share a holiday meal together. Help support the business locations below (Nov. 1 – 30, 2018), who support your Foodbank’s Holiday Campaign by collecting monetary donations from their customers this holiday season. A special thank you to: Bair’s Powersports, Deli Ohio, Mainstream Boutique, Northside Cellar, Ron Marhofer Auto Family and The Rail. For a complete list of participating locations, visit akroncantonfoodbank.org/holiday. Double Your Dollar Day on Cyber Monday, Nov. 26, 2018, is an online match promotion. While making holiday purchases online, please visit akroncantonfoodbank.org and make a donation. For every $1 donated, a generous friend of the Foodbank will make a matching gift. On this day, $1 = 8 meals. Gather your family, friends and coworkers and Dine Out on Giving Tuesday, Nov. 27, 2018 for breakfast, lunch and dinner! At participating locations, 5 percent of your check will be donated to the Foodbank. A special thank you to: BOMBA Tacos & Rum, The Rail, Street Side & Whiskey Alley. For a complete list of participating locations, visit akroncantonfoodbank.org/holiday. Drive by and donate during the Long Haul Against Hunger radiothon on Dec. 7, 2018. Listen to iHeartMedia radio stations, including 98.1 KDD, My 101.7, Rock 106.9, 99.7 Canton’s New Country, Fox Sports 1350 and 640 WHLO from 6:00am-7:00pm on Dec. 7, 2018 for details on this exciting event. Food and monetary donations will be collected at two Giant Eagle locations. Financial donations will be matched by generous sponsors including FirstEnergy Foundation and The J.M. Smucker Company throughout the day. Run or walk in the Selfless Elf 5k on Dec. 22, 2018. Dress in your favorite holiday-themed costume or running gear, and run or walk the 3.1-mile course beginning and ending at the Foodbank. Race begins at 8:00am. Visit selflesself.com to register or for more information. To learn more about the Holiday Campaign, please visit akroncantonfoodbank.org/holiday or contact the Foodbank at 330.535.6900.